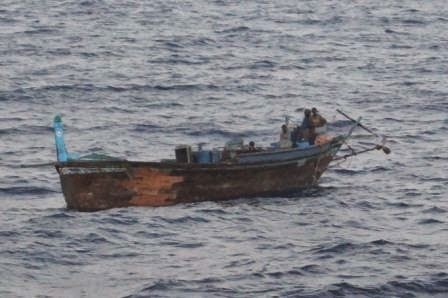 In a closely coordinated operation undertaken by the Indian Coast Guard and Indian Navy, a boat carrying a large quantity of narcotics was apprehended in international waters, off the coast of Gujarat on 20th April 15. The operation also resulted in the apprehension of eight Pakistani nationals manning the boat. The operation was launched on 18 April 15, based on the intelligence inputs, and was conducted in close coordination by Coast Guard Regional Headquarters(NW) and Headquarters Western Naval Command. Multiple units from the Coast Guard and Navy were deployed for the operation, which included Indian Coast Guard Ship Sangram along with IN Ship Nirghat and Kondul. The search was augmented by extensive aerial searches undertaken by Coast Guard and Naval aircraft including Dorniers, IL-38 and P8Is. In a display of seamless coordination, the suspect boat was intercepted by ICG Ship Sangram in the wee hours of morning of 20 Apr 15, and thereafter apprehended later in the morning, whilst IN ship Kondul provided support to the entire evolution. The initial investigations by Coast Guard Ship Sangram have led to recovery of 232 packets of narcotics(suspected to be Heroin and worth upto Rupees 600 Crores in the international market). Additionally, satellite communication phones and Global Positioning Systems, being used to facilitate transhipment of the contraband to another boat were also confiscated.